I first travelled to Newfoundland in the spring of 2000 to make some sketches to illustrate a couple of Al Purdy poems for my hand printed book ‘Home Country”. We flew into Gander and drove to Twillingate and up the northern peninsula to L’anse au Meadows, along the coast to Gros Morne and flew home from Deer Lake. I hoped to see icebergs, and we saw hundreds, like a parade passing by Cape Onion day after day. I sketched in watercolour, buying mittens, and wearing several layers of clothes and coats. We drove 100s of kilometers, taking photographs, watching whales frolic and feed, and fell in love with the amazing landscape, the emptiness of the coast line, and the people we met. We vowed to come back, but somehow didn’t until 13 years later. That experience of Newfoundland stayed with me. And when Michael Crummey came to read in Parry Sound as part of Parry Sound Books reading series, he read from his novel ‘Galore’ which I had loved reading. He also read a few new poems. As he read his new work images started to come into my mind, as I listened to the poems I thought right away that I could do something with them. The following spring I approached Michael at the book launch for his new book of poems ‘Under the Keel’. By then I had read through his previous books of poetry and asked Michael if I could illustrate a series of his poems and print them in a limited edition book. 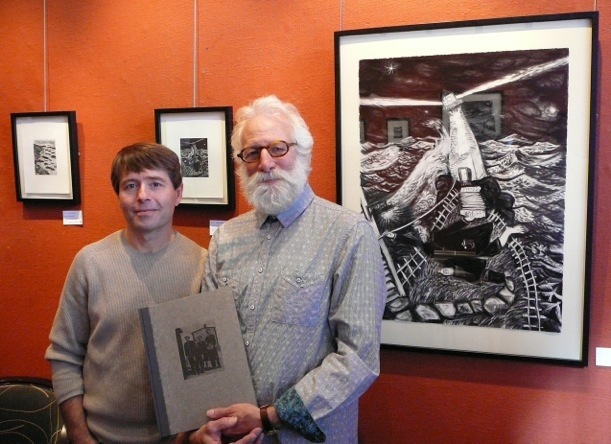 Michael had seen my earlier work and visited my press on his trip to Parry Sound, and he agreed. In the fall of 2013 we finally returned to Newfoundland. This time to St. John’s and the Avalon Peninsula, to sketch and discuss the book with Michael and to meet his friends and family. We drove together up to Michael’s place in Western Bay, and our collaboration on the book ‘Viewfinder’ began. As Michael wrote this project, is about ‘…our transient place in the natural world with the ephemeral traces we leave as we pass”. 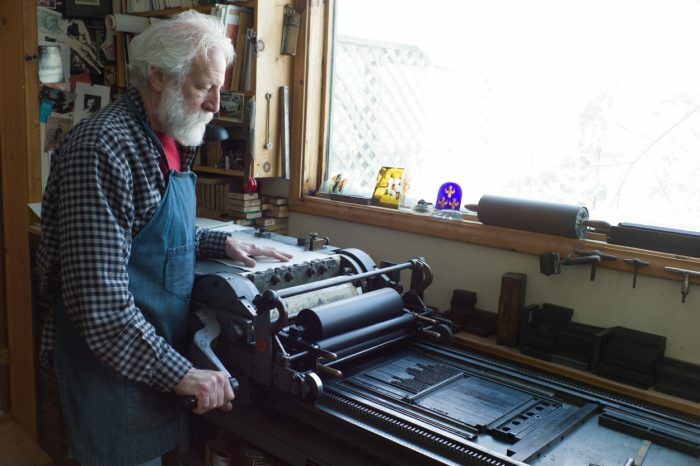 When creating a hand-printed book I let the slow process of setting the type and hand printing the poems lead to a very deep reading of the work and to the creation of a number of quick sketches that become the basis for the final drawings for the wood engravings in the book. As part of this process I also made 6 large charcoal drawings, further interpretations of the sketches. When the book was complete, I started a series of pastels based on the sketches I made on the Avalon. Another trip to Newfoundland, this past spring, took me up the Bonavista Peninsula stopping in every little cove, looking for the remains of fishing harbours and stages, old churches and graveyards. I made on-site sketches and took photographs, always looking for a way to tell a story about the place through my work. A year ago I travelled to Calgary in the spring for a family wedding. It had been many years since we’d driven across the country and we decided to take the small rural roads through southern Saskatchewan, Manitoba and Alberta. It was this landscape of abandoned towns, villages and grain elevators and family farms that caught my imagination, sadly beautiful, along with the spectacular vistas of grain fields, endless horizons and big skies. Georgian Bay, of course, is my home. The landscape here is elemental to my being.